The green roof was one of the best decisions we made when building our new house. I’m a total convert. The practical advantages of having one are well known – great insulation, controls rain water run-off and long life. I have been delighted by the aesthetic delights of it, however. We went with a wildflower green roof rather than using altogether duller sedum. It’s now a secret world, pretty much. It’s over our ground floor so we can see it from our office on the first floor, although the only way I can watch its minutiae is through my camera or binoculars from here. I can’t get up onto it except by ladder, and only do as a real treat. Most of what we’ve planted has taken, and this mini-jungle is creating its own mini-ecosystem. Solitary bees whizz about and have started nesting in the timber sitting up there which I drilled holes in. Butterflies flutter curiously, while on the ground level I can see beetles and spiders scuttling around. Tiny delights appear through my lens. A plantain in flower or a goldfinch foraging for seed, a poppy bending under the weight of a ladybird or the purple pollen a bumblebee collects from a self seeded phacelia plant. Common plants look weirdly exotic and exciting, like the alien forest of Salad Burnet flowers above. 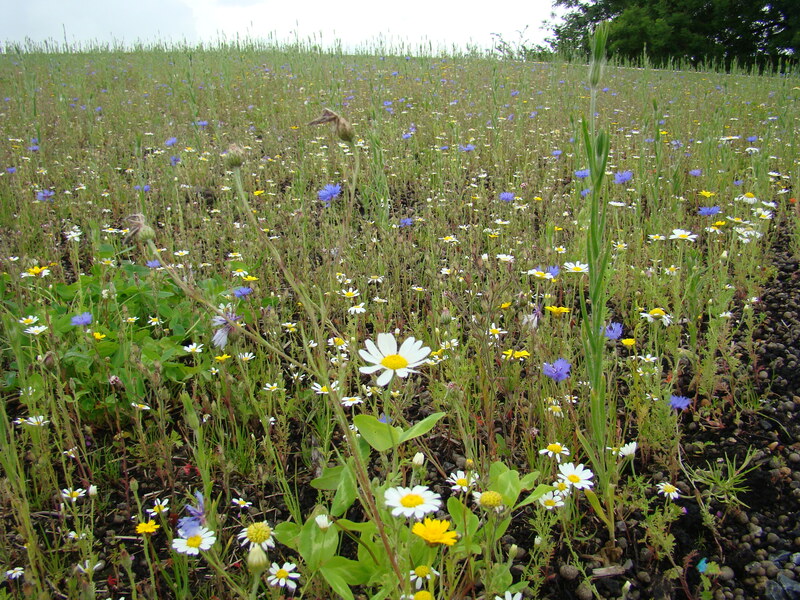 And unlike creating a traditional meadow on the ground it has been incredibly easy and instant. The substrate is miserly enough that any dock, nettle and thistle brought in by birds all struggle until weeded out. We didn’t plant any grass, but the plants which have arrived behave very nicely. OK, so with the benefit of hindsight the “honey brown” wood preservative I bought for my new shed was more honey orange. Or just orange. It wasn’t the first mistake I made while building the new shed, and it certainly wasn’t the last. Anyway, it’s up and it seems to be staying up, at least for the time being. I’ll be honest, it has taken me days of labour. I had to make the base – twice, because the first time it wasn’t level. I had to paint it orange and then assemble it. Despite the frustration and time spent all this has given me a blokey sort of thrill, but the real excitement was yet to come. My shed has a green roof – or, to be more accurate, at the moment it’s more grey with green bits in – and I made it. AND it’s not sitting on the shed floor. Yet. I’ve wanted to make my own green roof ever since I started learning about them a couple of years ago. We’re putting one on our new house designed by Gary Grant, but I wanted to see how difficult it was to make a small scale DIY one and whether, if it was practical, whether we should start to sell the substrate and liners for them as well as seed and plug plants. The news is that it is – well – pretty straight forward. I followed Gary’s partner Dusty Gedge’s guidance on how to build a domestic green roof, which was very clear. I only had to go off piste on the downpipes, which I’m still thinking about as a consequence of the shed’s slightly odd design. I’ve put lots of timber reinforcement inside the original structure, load bearing and bracing, which I didn’t initially think would be necessary but once I’d finished can now well understand. Even the ultralite substrate I used – and which we’re now selling – will get up to around 80kg per square metre when fully saturated. Dusty and Gary champion using native wildflowers on roofs rather than the sedum matting people often use, which is of limited interest to me too. As much as anything else I want the diversity and colour green roofs can bring, which leads me straightto native plants. I planted it with wildflower plugs rather than seed as it’s a relatively small area. 10 plugs per square metre is what’s recommended, and although it looks a bit like a lunar landscape at the moment they will soon get going. The species mix is specifically for roofs, and it also means we can grow some plants which wouldn’t do on our heavy clay. I’m now ludicrously proud of the whole thing and can’t wait for the roof to develop. We’ll be chronicling it as it does and posting more pictures. I’ve hung a bee box on the side of the shed, but I’m hoping we’ll get miner bees digging into the substrate. It should be brilliant for butterflies too; the bare areas will warm up in the summer, encouraging them to bask there. It will provide a quite different micro-habitat to everything else going on arround in the garden. Brilliant. All I’ve got to do now is to repaint it in something pastel. Sigh.